Sometimes food can become a bit too complex. Now, there's nothing wrong with complex, some of the stuff I've made up on this blog has been a bit difficult, but sometimes it all gets a bit tiresome. Standing in my kitchen over a long-simmering pot, or separating a handful of eggs, or prepping the last of a gajillion and one ingredients--that all starts to wear on me after a while. So every now and then, it's good to revert back to simpler recipes and simpler techniques to keep me from going crazy. And by simpler, I mean using leftovers. I've got enough homemade Longanisa in my freezer to stretch from here to Manila and back, and I've been wanting to deplete that supply so that it only reaches Hawaii. That's a lot of Longanisa to use up. Luckily, this fried squash blossoms post by Wandering Chopsticks set off one of those flickering lightbulb thingies above my head. Except, instead of stuffing squash blossoms full of minced shrimp, like Wandering Chopsticks did, I figured I'd use some of the Longanisa in my freezer. And, as we are in the last throes of summer here in SoCal, I wanted to make sure I took advantage of the squash blossoms at the local farmer's markets before they were all gone. 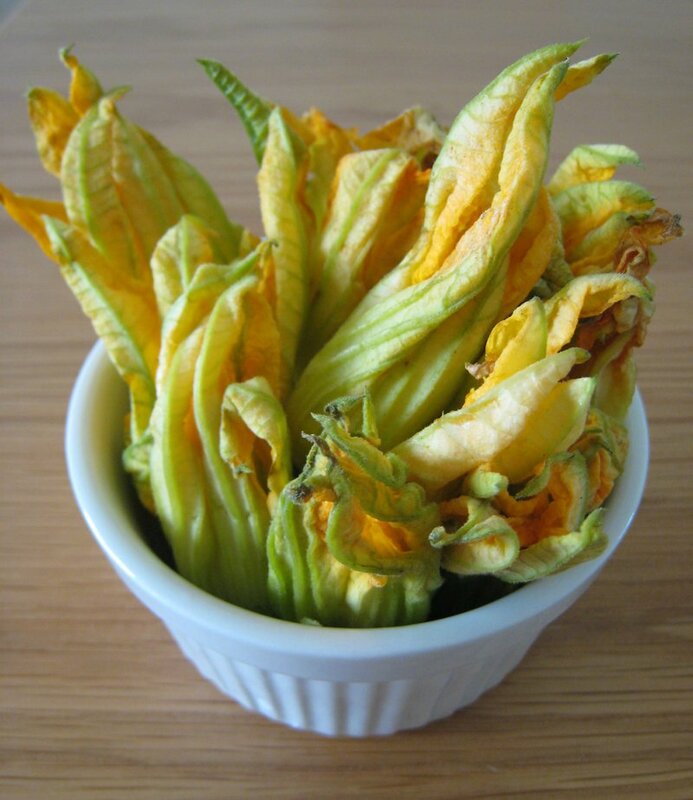 Before putting anything in your squash blossoms, you should be sure to give them a gentle rinse, inside and out, as there may be bugs or machete-wielding leprechauns inside them. I rinsed my squash blossoms in the basket of my salad spinner and then gave them a quick spin to dry. After ridding the squash blossoms of murderous midgets, I thawed out my Longanisa. Now, I didn't just stuff a link of Longanisa into a squash blossom. I actually removed the casings from a couple of the sausage links and used the ground pork as a stuffing for the squash blossoms. Longanisa served without a casing is referred to as "hubad", and hubad literally translates to "naked". I'm serious. I stuffed blossoms full of naked Filipino sausage. You don't want to overstuff your squash blossoms, otherwise the pork may not cook all the way through. A teaspoon of pork per flower is more than enough. After stuffing a squash blossom, gently twist the petals together to seal and to keep the meat from falling out. After you've got all of your blossoms full of naked sausage, dip them in a tempura batter and then fry them in some hot oil. You can prepare a light tempura batter by mixing a cup of rice flour with about 2 cups of soda water. This yields a very thin batter, but results in a very crisp and light texture once fried. Rinse and dry the squash blossoms. Stuff each squash blossom with about a teaspoon of pork that was removed from the sausage casings. Gently twist the tops of each squash blossom to seal in the pork. Place the rice flour in a large mixing bowl, and whisk in the soda water until a thin batter is created. 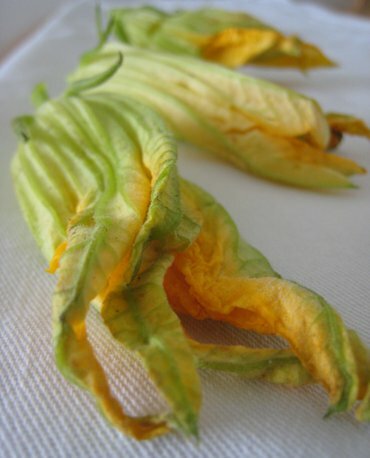 Dip the stuffed squash blossoms into the tempura batter and immediately place in hot oil to fry. 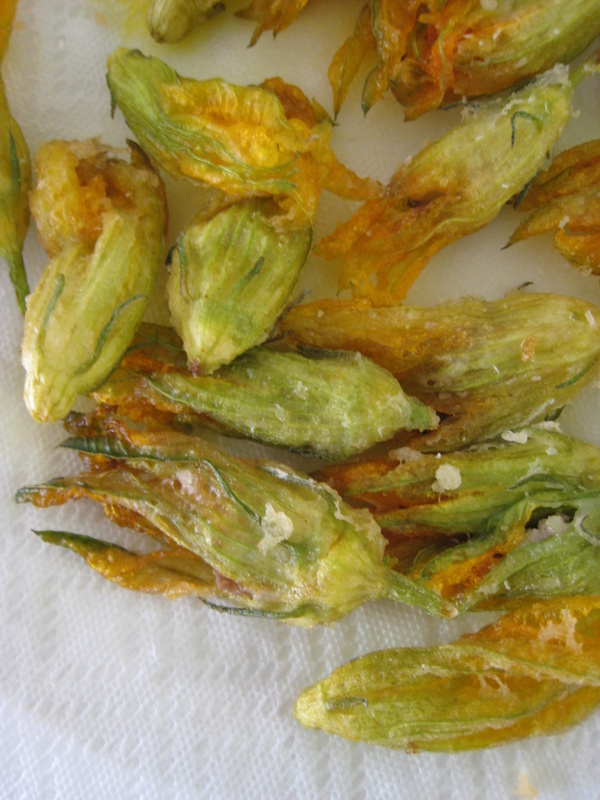 Fry squash blossoms 2-3 minutes, until crisp and golden. 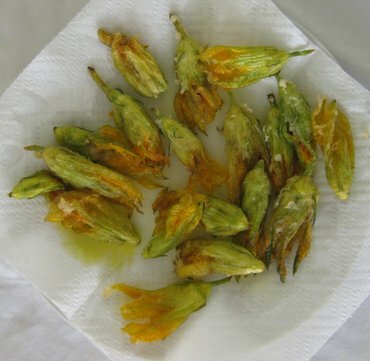 Drain fried squash blossoms on paper towels and sprinkle with salt. You didn't say what you thought of the taste. Was it worth the anticipation? i've always been wary of eating flowers...which is why i'm always puzzled when i see squash blossoms in my parents' kitchen. What a timely post! I just got some squash blossoms from the farmer's market that I will fry tempura style. I'll cook some with longanisa. Waow they're look really beautiful and yummy. Like you, I like them fried (with basil, egg and garlic in the batter) or stuffed (with zucchini). I will post these nicoise recipes on my blog some time next year when they are back in season. ha haa...I've heard of lumpiang hubad but not longanisang hubad. I miss longanisa...I love having it anytime of the day with eggs and sinangag...yum! Hi Wandering, the flavor was good, the green part tasted like fried zucchini because, well, that's basically what it is. I've had fried squash blossoms before, so I knew what to expect. Thanks for the inspiration! 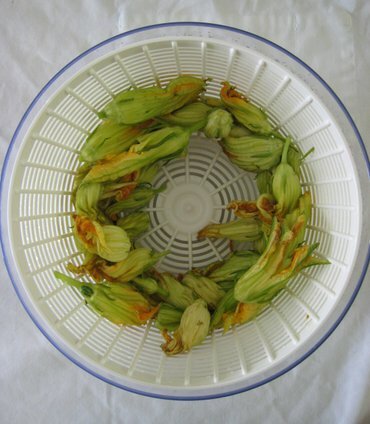 Janice, squash blossoms are veggie than flower. You should give them a try sometime, they are very good. Oggi, definitely give them a try with longanisa if you have any. They are very easy to prepare. Maybahay, your whitebait tempura looked very tasty! You are very right joey. Longanisa is good for many things. Hey Babette! Squash blossoms don't taste flowery or perfumy in the very least. They taste like the squash or zucchini from which they grow. Hello Laurent. Thanks for stopping by. I actually had fried squash blossom in Nice a couple of months ago. I love Nicoise cuisine! 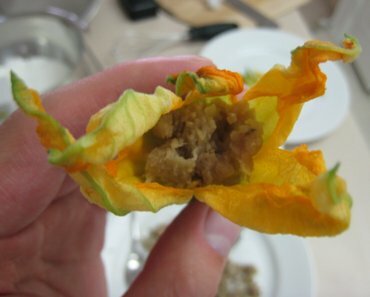 Squash blossoms with longanisa? :O are you sure??? I can't even eat longanisang hubad. I used to make longanisa growing up w/ my Lola and my dad. So I'm very stubborn when it comes to NOT having longanisa w/ rice and eggs :D Honestly, I don't think I've had longanisa any other way in my 21 years on this Earth. Krizia, yes, I'm sure! I agree with you, longanisa w/rice and eggs can't be beat. But give longanisa a try in other forms too. Hi shalimar. yes, courgette flowers is always delicious stuffed with cheese, but do try longanisa. You should patent this. Can you do that? *L* It's amazing how you come up with these unusual food combinations and presentations. Hi Jen. Lonanisa-stuffed squash blossom are definitely a great appetizer. I make a pork and pumpkin lumpia which is delish, but now I'm thinking it'd be even better with longanisa!